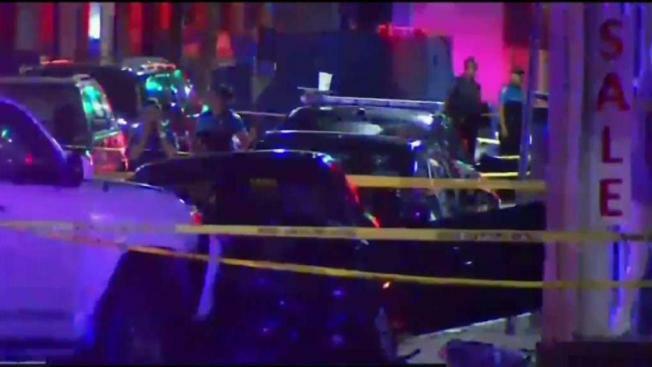 A Maryland woman was killed after police opened fire on her after she ran her car over a Miami Beach police officer Sunday night, officials said. News4's Shomari Stone spoke to the woman's father. The minute before a 22-year-old Temple University student drove her BMW into a police officer on Miami Beach and was fatally shot "played out like a movie set'," said a retired homicide detective who witnessed the incident. Cariann Hithon of Bowie, Maryland, crashed into several cars Sunday evening as people watched from sidewalk cafes in the tourist area of South Beach, police said. "It played out like a movie set with people running, screaming, car crashes, gunshots, an injured officer lying on his back on the ground -- all within a minute,'' retired Miami-Dade homicide detective John Butchko, whose car Hithon hit, told the Miami Herald. According to investigators, Hithon was driving a black BMW at a high speed when she crashed into two vehicles on 12th Street and Ocean Drive and fled the scene. "The car was coming westbound from Ocean on 12th and went through the red light, struck an occupied car on 12th and Collins," said Chief Dan Oates, with the Miami Beach Police Department. "At some point, the driver made a decision to speed away, and she continued west on 12th Street." As she fled from the crash, she struck another vehicle on Lincoln Drive, police said. Several people surrounded the driver, telling her to get out of the car. Once police arrived on the scene and asked Hithon to get out of the car, she slammed the accelerator and ran over a police officer, officials said. "One of the cops was in front of the car, and when they were yelling at her to get out of the car, she just started the car again," said Miguel Garcia, a witness. Police officers fired several shots at the driver's black BMW, striking Hithon. Both Hithon and the officer were taken to Jackson Memorial Hospital's Ryder Trauma Center, where Hithon later died. The reason Hithon tried to flee may never be known. But investigators said they believe Hithon and her male friend - who was seen by witnesses casually getting out of the car before she accelerated - may have been drinking heavily earlier Sunday. Miami-Dade police detained that man, 22-year-old Ryan Jerrell Lucas, for questioning, according to a news release. The agency is investigating the case, which is typical when a Miami Beach police shooting occurs. Additional details, including Lucas' hometown, were not released. The officer who was struck, later identified as David Cajuso, was hospitalized in stable condition and later released. "Our officer who was injured, we know he lost consciousness at the scene for a period of time," said Oates. "He is now at the hospital. He is stable and alert but he is being treated for his head injury and undetermined at this time internal injuries." Hithon's father, retired U.S. Navy Capt. Cary Hithon, told the newspaper his daughter wanted to be "the attorney to save the world." "Everybody that knew her, knew she had a great future," he said. Hithon's father said she had recently transferred from Hampton University in Virginia to Temple University in Philadelphia and expected to graduate with a degree in political science in the spring. While attending Hampton University, Hithon had contact with police at least six times and was charged with misdemeanor assault and battery, marijuana possession and falsely identifying herself to a police officer, according to court records. None of those charges ended in a conviction. She was found guilty of speeding in December 2015 and improper control while driving in March 2016. Her license was also restricted for six months in 2016 to driving to and from work and church in relation to a marijuana possession charge in March of that year. In Maryland, she was also charged with several motor vehicle offenses in 2015 and 2016, including speeding, driving with a suspended license and giving a false name to police. Police have not released the name of the officer who shot Hithon. The shooting remains under investigation. Hithon's father says he has "a lot of questions'' about what happened.